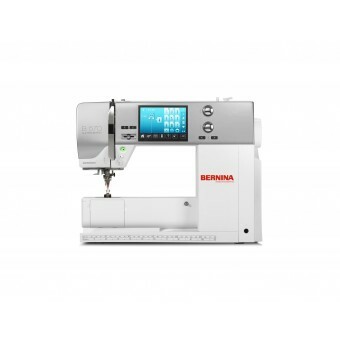 The Bernina B570QE provides an exclusive level of stitch control. Whether altering the stitch length (up to 5mm), width (up to 5.5mm) or needle position (11 different positions) or even creating custom combinations, you will appreciate the convenience of a machine that remembers the stich details for you. The Bernina B570QE is a genuine all-rounder that can both sew and quilt. Additionally, the B570QE can accept the optional embroidery module. The touchscreen makes changing from sewing to the embroidery mode extremely easy. Included in the machine are 50 built in embroidery designs to choose form, plus you can upload your own designs via the USB port. All embroidery designs can be edited on the touch-screen including rotation, mirror, rescale and colour change. With a massive 642 stitch library the Bernina B570QE will be sure to fulfil your sewing needs, selecting stitches couldn’t be easier thanks to the user-friendly touchscreen. Should you get stuck the Creative consultant offer’s on-screen help and support. The unique free hand system (FHS) raises and lowers the presser foot while also releasing thread tension and lowering the feed dog meaning both hands can stay in control of your project. The extension table supplied is great for those larger projects where extra support is needed. The Bernina B570QE includes as standard the Bernina Stitch Regulator (BSR) which will help you master the techniques of free-motion quilting and embroidery. Ensuring the stitches are consistent by increasing or decreasing automatically the sewing speed of the machine. This is a great option for both beginner and experienced quilter’s.